Home › Best-Sellers › All-Clad 700362 Mc2 Professional Master Chef 2 Stainless Steel Tri-Ply Bonded..
All-Clad 700362 Mc2 Professional Master Chef 2 Stainless Steel Tri-Ply Bonded.. 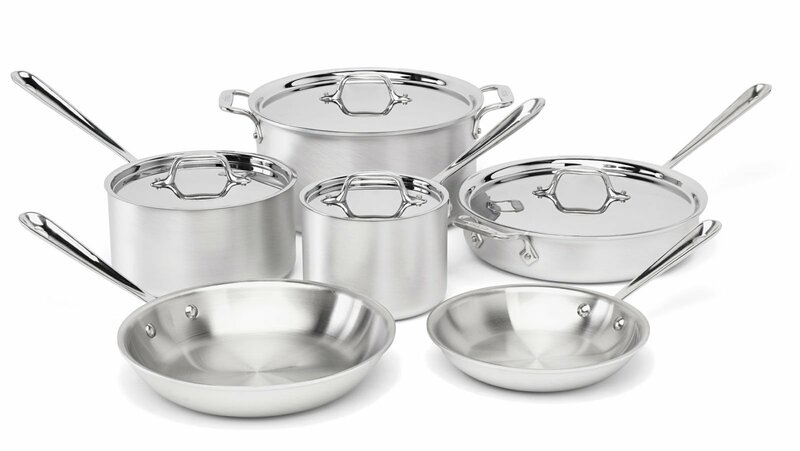 Size:10-Piece Providing an array of everyday essentials, the All-Clad MC2700362 10-piece stainless-steel cookware set includes 8-Inch and 10-Inch frypans, 2-Quart and 3.5-Quart covered sauce pans, a 3-Quart covered saut pan,and an 8-Quart covered stockpot. The 3-ply bonded cookwares thick-gaugealuminum core pulls in heat quickly, while its 18/10 stainless-steel interior,with a highly polished starburst finish, ensures even heat distribution acrossthe entire cooking surface. The cookwares stainless-steel interior alsooffers natural stick resistance, letting you know when food is ready torelease, and it wont react with food, so theres no risk of food picking up ametallic taste. Made in the USA, MC2 cookware has a brushed-aluminum exteriorwith a smooth matte finish for low maintenance and fingerprint-free, long-lasting beauty. Enjoy professional performance with Master Chef 2 (MC2)All-Clads original range of cookware.